West Reading has the most crowded dining scene in Berks County. As the number of restaurants continues to climb, Penn Avenue continues to evolve. 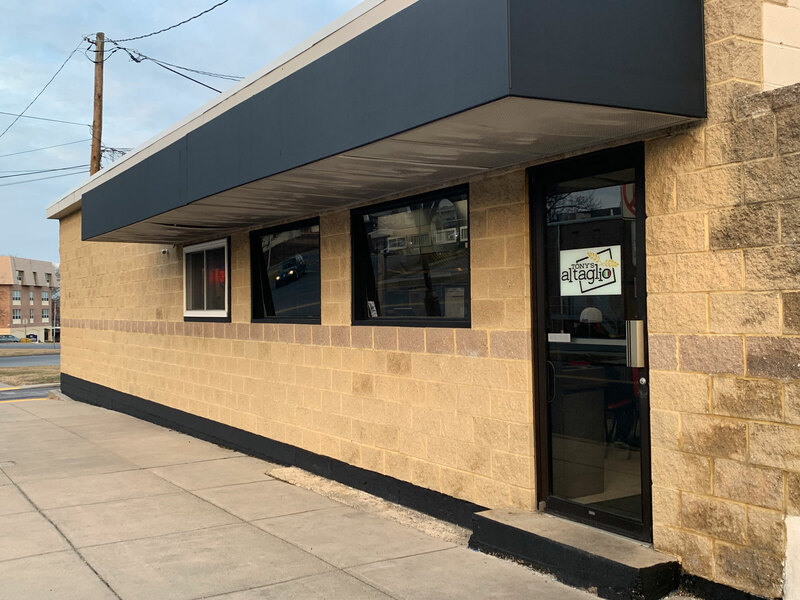 A recent loss in West Reading was Taste of Philly (formerly Mike’s Taste of Philly), which occupied a space just off Penn along Fifth Avenue. The space wasn’t vacant for long, though, as a new restaurant, Tony’s al Taglio, took root in late 2018. The red awning that once featured the Philadelphia skyline has been painted black. 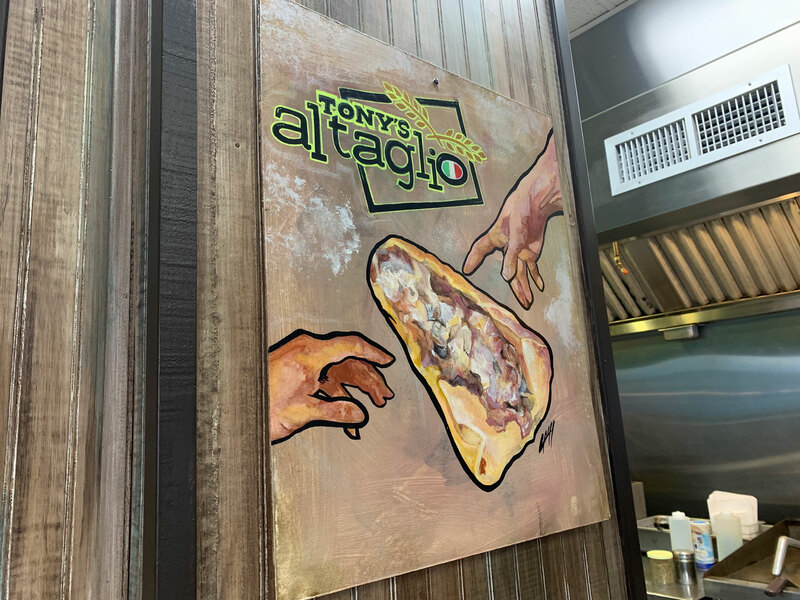 The only marking for the new restaurant is a small sign on the door with the Tony’s al Taglio logo. Inside, the only changes were to remove the Philly memorabilia from the wood-paneled walls. 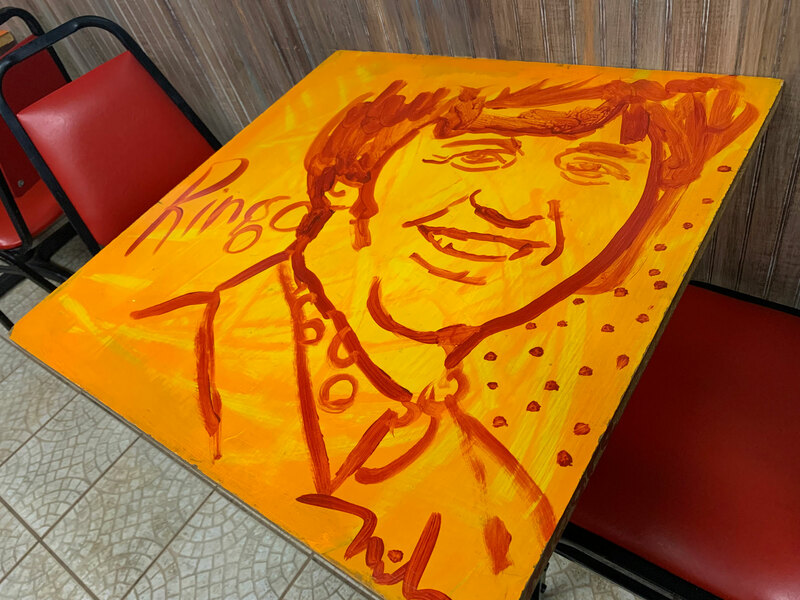 The tables, which feature artist renderings of The Beatles, are (I assume) leftover from when the Yellow Submarine occupied the space. (Mike’s always had tablecloths – Phillies red – on every table). Every great restaurant has something that differentiates them. 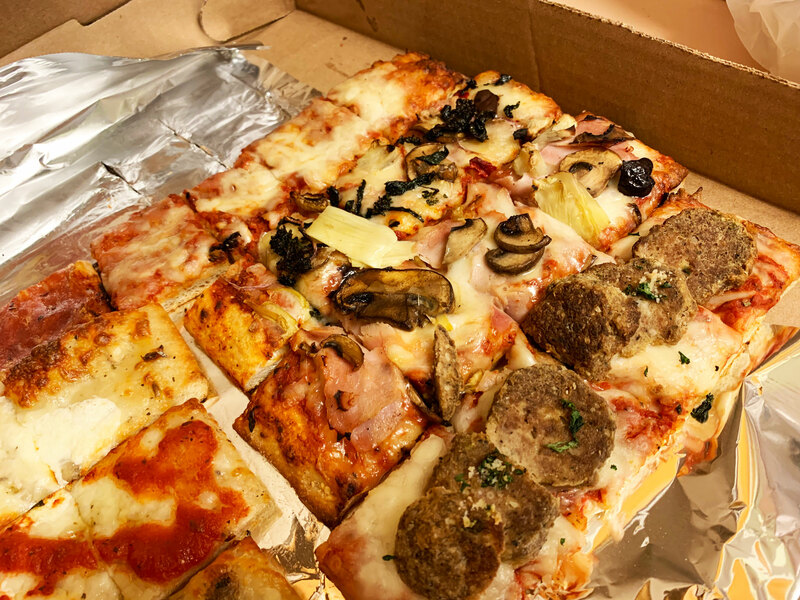 For Tony’s, it’s the Roman-style pizza, rectangular thin-crust pizzas that are served by the cut, not the slice. 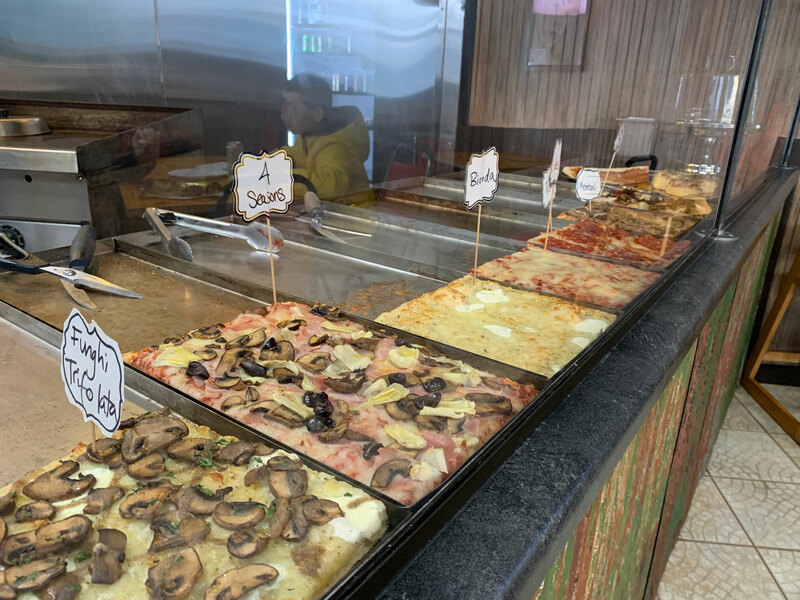 Customers can walk in, point to the pizza they want, choose how large of a slice, and the counter worker will use a shears to cut the pizza to the customer’s specifications. I asked for a variety, and so the server cut a strip off each of the eight varieties and into the oven they went for a reheat. 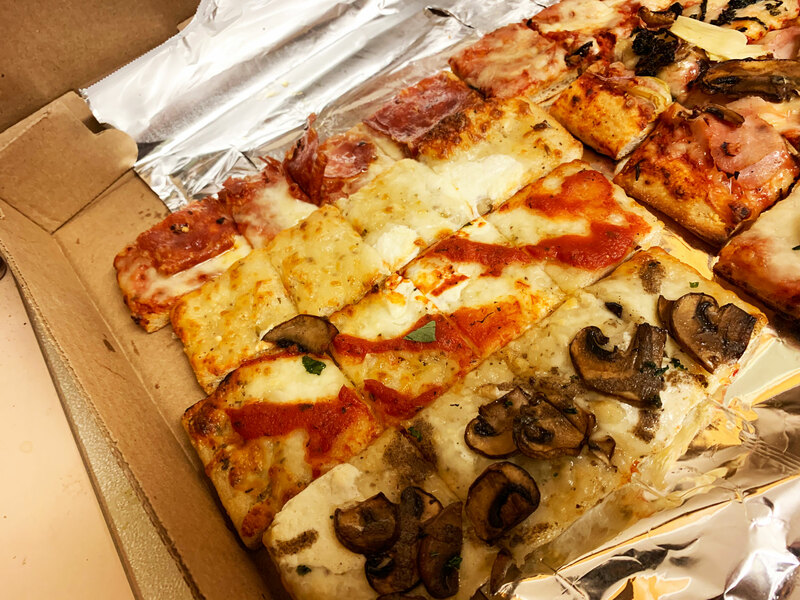 Each strip was then sliced into four squares, making them perfect for tasting all eight flavors without feeling guilty. I was getting the order to go, taking eight different style pizzas home for Julie, Jakob and I to try. The best one, in my opinion, was the Grandma Rita – a margherita-style pizza with fresh mozzarella and Parmesan, olive oil, basil and light tomato sauce. What separated it from other margherita pizzas was the addition of garlic. It just worked really well – the light, fresh flavors with the strong garlic. I would order this every time. A close second for me was the Picante. The spicy slice started with tomato sauce and mozzarella, then heated up with hot capicola, hot soppressata and Calabrian chili oil. In addition to being spicy-hot, the meat was flavorful. I loved it, even after the heat creeped up on me at the end. The second trip through the oven didn’t do any favors for the meatball pizza. The thin-sliced meatballs were a little tough, and I didn’t find them to be overly flavorful. 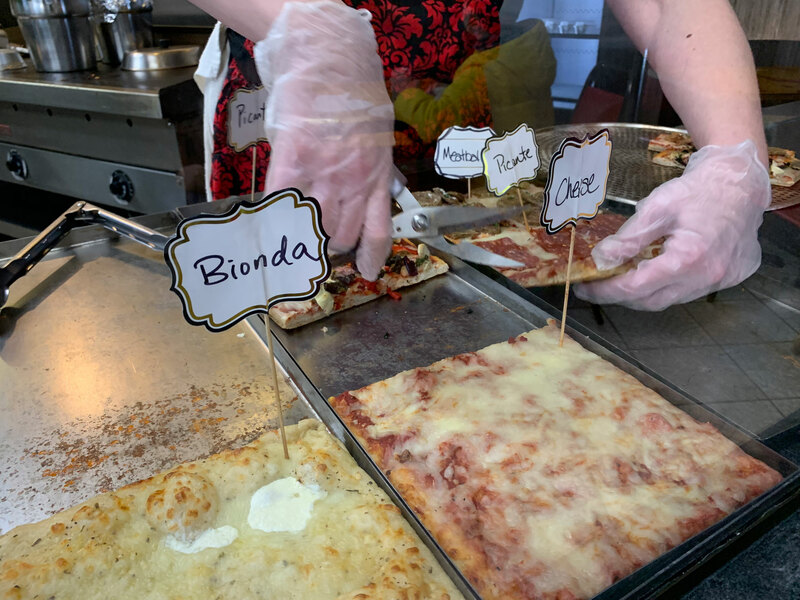 Similarly, the Bionda – white pizza – didn’t hold up well to the reheating. Topped with garlic, EVOO, Parmesan, mozzarella and fresh mozzarella, it was hard and chewy after its reheating. The flavor was good, though, and I would certainly try it fresh. I did like the funghi trifolata, however. Starting with a Bionda base, it had the addition of local mushrooms, truffle cream sauce and parsley. I appreciated the use of fresh mushrooms. I thought it worked better with the white pizza base than with a red sauce, but I especially enjoyed the richness of the truffle sauce with the mushrooms. The garden pizza featured red sauce and mozzarella topped with mushrooms, bell peppers, olives, spinach and red onion. I loved the thick pieces of onion and the sweetness they added. The 4 seasons wasn’t as big of a hit for me. A mozzarella and tomato sauce pizza topped with black olives, mushrooms, prosciutto and artichoke, the 4 seasons was one that I was really looking forward to. Unfortunately I found the olive to be overpowering, hiding the other flavors instead of enhancing them. Our eighth and final strip was the cheese pizza – traditional pizza sauce, grated Parmesan, mozzarella and oregano. 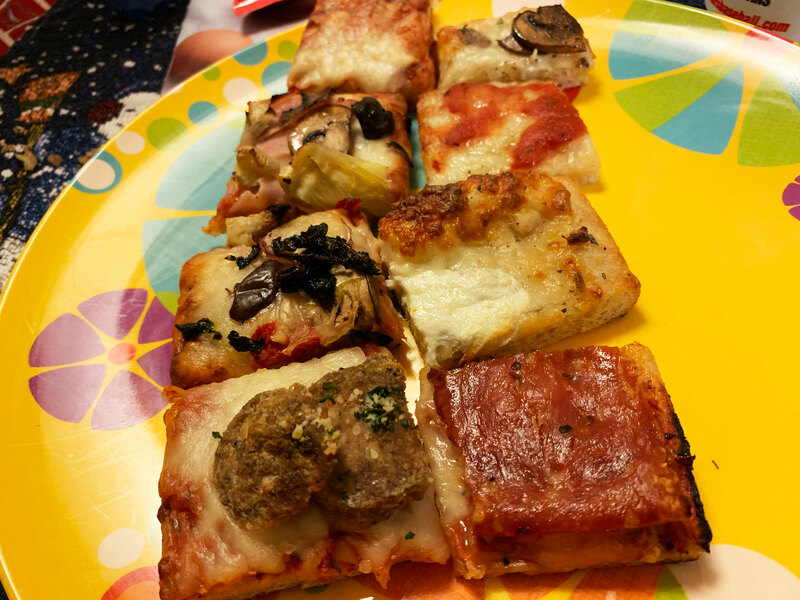 Not to sound like a broken record, but this was another one that didn’t fare too well in the reheat – the toppings on other styles really did keep the cheese from drying out during reheating. Otherwise, I thought it was good. Jakob did too as he ate half a strip of it himself. Looking at Facebook before our visit, I was drawn to another menu item that I had to try: rollatini. 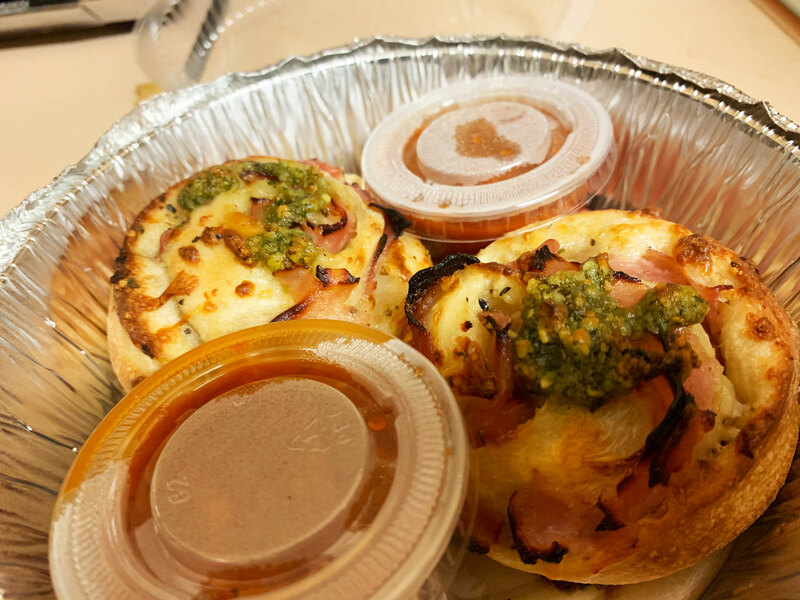 Looking like pinwheels of meat and cheese, the rollatini were filled with prosciutto and crescenza strachino cheese, topped with a pistachio pesto. It was delicious, the best thing I ate. The meat and cheese were a mix of sweet and salty that was enhanced by the nutty pesto. The side of marinara dipping sauce didn’t hurt but it wasn’t necessary. These were that good. 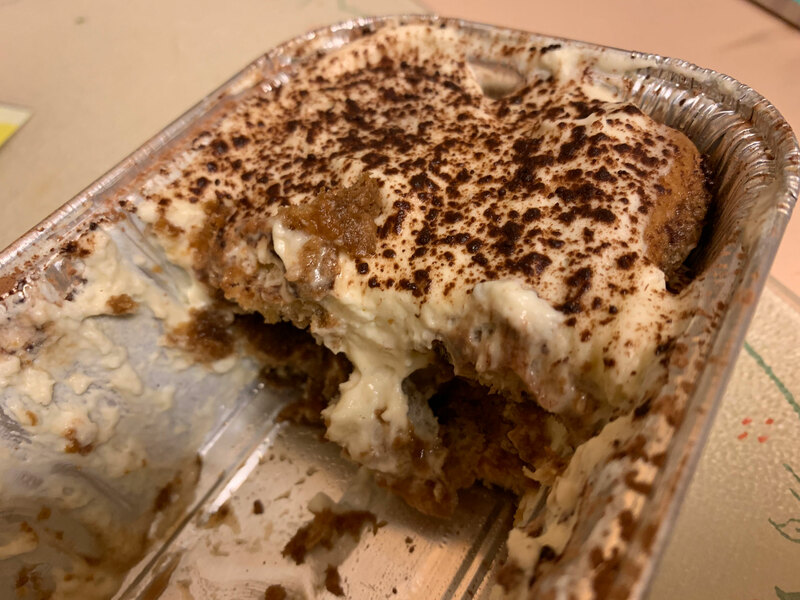 There was also homemade tiramisu in the case, and I couldn’t pass on that. 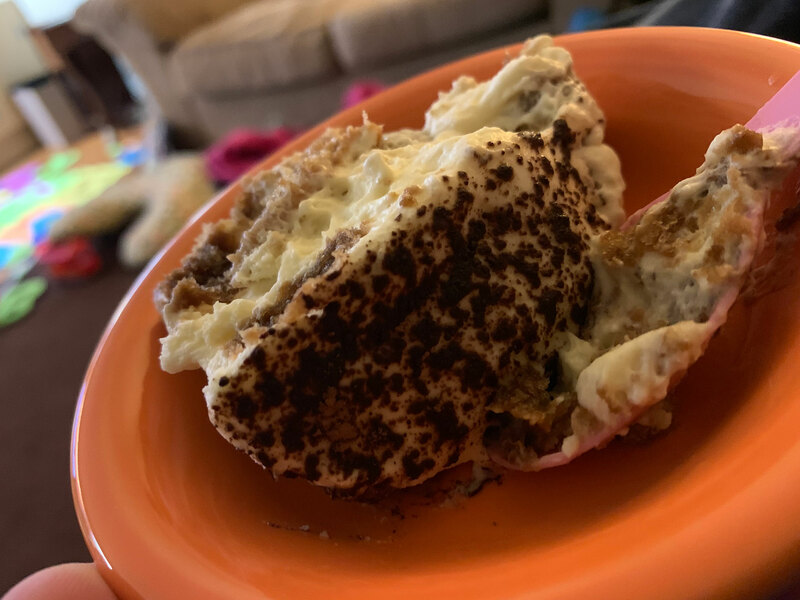 I was told that it was made that morning and that tiramisu gets better the longer it sits. I was also told there was no judgment if we couldn’t wait to eat it. Most can’t. Full disclosure. I’m not much of a coffee person. That said, I’ve also enjoyed tiramisu. But I’ve never tasted one with as much coffee as this one. It was a little much for my tastes, but it might have been because I had my slice from the end. Julie enjoyed her slice and didn’t seem to taste as much coffee as I had. When I was picking out everything, I was getting nervous about the final bill. When I found out it was only $22 and change, I was thrilled. In addition to pizzas, Tony’s al Taglio also serves arincini (deep-fried risotto balls) that I am anxious to try. There are also an assortment of Philly-style sandwiches, including cheesesteaks, Italian hoagies and a chicken cutlet sandwich. And I hope I have the opportunity to try them all because Tony’s will definitely be in my takeout rotation going forward.